It’s officially a midterm election year, and small-dollar donors are hitting the ground running. In January, they raised $45,885,947 for Democrats standing up to Republicans and organizations on the left. A record-setting 5,404 groups used our tools, and those campaigns and organizations are laying the groundwork for more victories in 2018. Additionally, we hit 4.5 million ActBlue Express users in January. 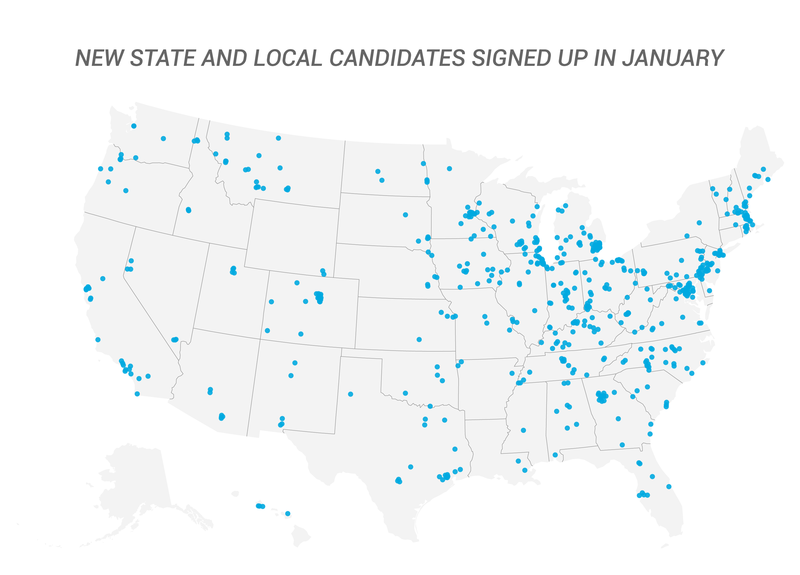 This is a huge — and continuously growing — pool of grassroots donors across the country who have saved their payment information with us so they can give to groups on ActBlue with a single click. All of this money and engagement produced another record: we printed more checks to send to campaigns and organizations than in any other month! Our three-person Political Operations Team sent nearly 13,000 checks over the course of the month. That’s almost two and a half times the number of checks we sent in January 2017. Grassroots donors gave 1,334,297 contributions to campaigns, organizations, and nonprofits in January. That’s over 100,000 more contributions than we saw in January 2016, which kicked off a presidential election year. The total dollar amount raised also increased by a whopping 36% from January 2016. Concerned citizens and activists are doubling down on the midterms. We’re also seeing impressive growth in the number of groups using our tools every month. January 2018 was the biggest month for new entities signing up to use our tools since 2012: nearly 1,200 campaigns and organizations submitted account setup requests. Many of the new groups were state and local candidates, including 42 in Michigan, 20 in West Virginia, 24 in North Carolina, and 20 in Texas. Democrats are building robust down-ticket benches across the country. 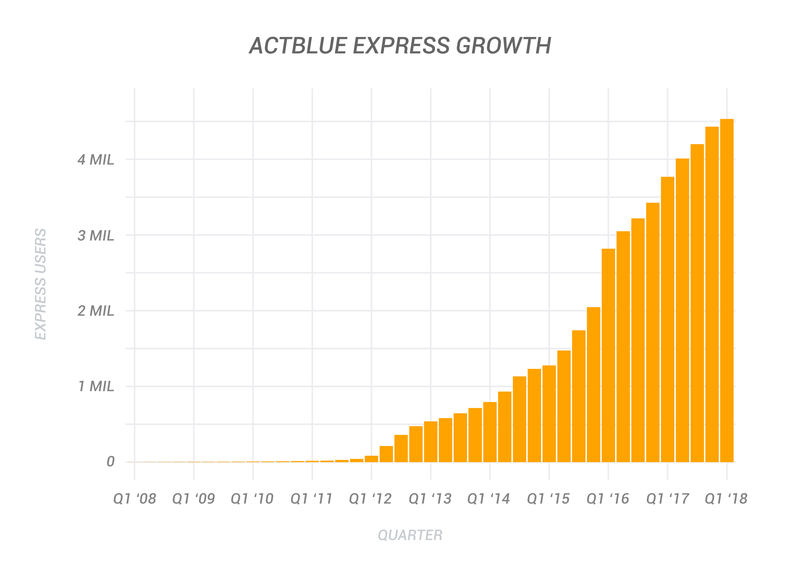 More than 80,000 folks signed up for ActBlue Express in January, pushing the total number of ActBlue Express users over 4.5 million. 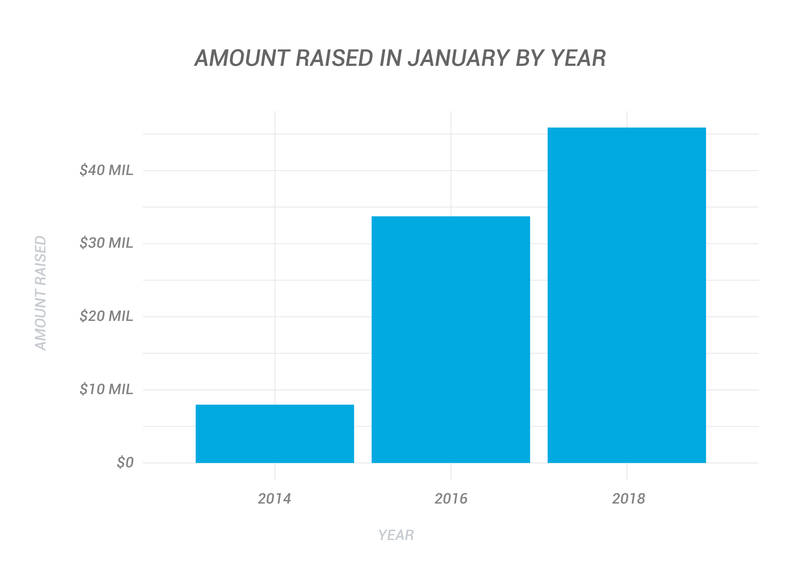 About two-thirds of all contributions last month came from ActBlue Express users, and as the midterms and important state and local elections approach, this feature will ensure supporters can give to their favorite campaigns and causes without a second thought. Our contribution forms are automatically mobile-optimized so that campaigns and organizations can reach supporters at all times and on any device. In January, 42.6% of all contributions on ActBlue were made via mobile. Mobile giving is only going to continue growing, so everyone — from candidates for school board to national advocacy organizations — needs to make mobile a core part of their fundraising strategy or risk missing out on contributions. Recurring contributions made up 24.9% of total volume in January. As we prepare for the extremely consequential midterms, recurring contributions will make it possible for Democrats from coast to coast to compete with the GOP’s mega-donors right up to Election Day. Grassroots donors threw down the gauntlet in January. While the Koch brothers and other big spenders think their millions will protect Republicans this fall, we know that our people power has a bigger impact. If you want help fundraising for your favorite candidate or want to set up an ActBlue account for your organization, or if you have questions about this post, get in touch with us at info@actblue.com.